His Holiness Jigdal Dagchen Sakya Rinpoche (the founder and Principal Guru of Sakya Monastery of Tibetan Buddhism in Seattle, WA) was born into the Phuntsok branch of the Khön lineage in 1929 in southwestern Tibet. As imminent successor to the throne of Sakya and future head of the Sakya School of Tibetan Buddhism, under the guidance of his father and other distinguished Lamas, Dagchen Rinpoche received instructions in the Hinayana, Mahayana, and Vajrayana systems of Buddhism. Upon completion of this comprehensive training, Dagchen Rinpoche received the unbroken Sakya lineage transmission of the Sakya Vajrakilaya and Hevajra initiations and the complete Lamdre Tsogshe (Path and Fruit), which are the main teachings of the Sakya tradition. Following this period of intensive study and initiations, Dagchen Rinpoche went into a long series of study and meditation retreats. He then conferred the Lamdre Tsogshe to monks, nuns, and lay people of Sakya. After the passing of his father, Dagchen Rinpoche took a leave of absence as ruler of Sakya in order to travel to East Tibet to increase his knowledge and experience of the Dharma, by studying with the renowned teachers of that area. Two of these lamas also became Dagchen Rinpoche’s root gurus, Dzongsar Khyentse Jamyang Chökyi Lodrö and Dilgo Khyentse Rabsal Dawa. These two highly realized masters helped to formulate Dagchen Rinpoche’s non-sectarian approach to Buddhism. After completing his major religious studies, Dagchen Rinpoche bestowed initiations and teachings throughout East Tibet and established 17 Sakya colleges and 10 retreat centers in that region. In 1955, he conferred the Lamdre Tsogshe, for a second time, to over 1200 practitioners in Minyag, East Tibet. Entrance to the Phuntsok Phodrang Sakya Heritage Society in New Delhi, India. In 1959 Dagchen Rinpoche, his wife H.E. Dagmo Kusho Sakya, and their family were forced to flee to India, where Dagchen Rinpoche became the Sakya representative to the Tibetan Religious Office in Exile, which was instrumental in arranging for the resettlement of Tibetan refugees. The following year he was invited to participate in a research project on Tibetan civilization at the University of Washington sponsored by a Rockefeller Foundation grant. 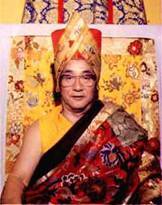 Dagchen Rinpoche resided in Seattle since 1960 along with his wife, five sons and other family members. Appreciating the benefits of American freedom and prosperity, he worked actively to help preserve and share the Tibetan Buddhist tradition. To this end he had given extensive empowerments and teachings throughout the United States, Canada, Europe and Asia. In 1974 Dagchen Rinpoche co-founded with Dezhung Rinpoche the original Dharma Center called Sakya Tegchen Choling. 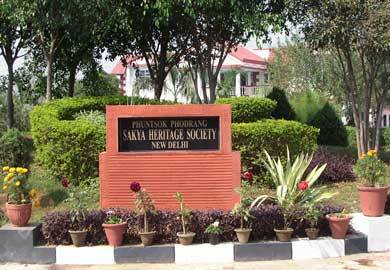 In 1984, the group reorganized and the name Sakya Monastery of Tibetan Buddhism was adopted. H.H. Jigdal Dachen Sakya established Sakya Monastery as a seat of cultural and religious learning in the West. After a lifetime of 85 years devoted to the practice, preservation and sharing of the Holy Dharma, Dagchen Rinpoche passed away on April 29, 2016. At the moment of his passing, he entered into a state of luminosity for one week, which is known as Thukdam meditation. During this period, a highly realized Lama is able to meditate on the “clear light stage,” the ultimate process of the inner dissolution of the five elements and consciousness. Remaining in the state of Thukdam for seven days, His Holiness then passed into Parinirvana on May 5, 2016. Forty-nine days of devoted traditional religious prayers and ceremonies ensured. During the forty-nine days of inspiring prayers, numerous astrophysical phenomena appeared over the skies of Seattle. The National Weather Service reported on May 8, 2016 on Twitter: “Probably the best Aurora display we’ve seen in over a decade in Seattle. Simply amazing.” This event was auspicious and extraordinary because over thirty years ago, His Holiness was asked by one of his students if there would be a sign when he died. He nonchalantly responded that there will be fireworks. Also, throughout the 49-day prayer service, rainbow-like halos appeared around the sun almost daily. The blessing of His Holiness Dagchen Rinpoche is like the warmth of the sun after a day of cool rain – gentle and invigorating. The sublime legacy of His Holiness continues in his grandsons: H.E. 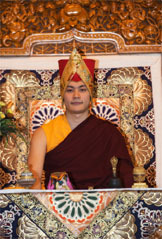 Sakya Khöndung Avikrita Rinpoche, H.E. Sakya Khöndung Abhaya Rinpoche, and H.E. 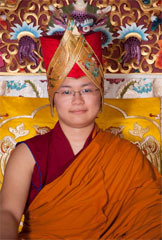 Sakya Khöndung Asanga Rinpoche. His Holiness Trinley Sakyapa was born in the Phuntsok Palace of Sakya in the third month of the Wood Dog year. His father was Trichen Ngawang Thutop Wangchuk, throne holder of Sakya, and his mother was Gyalyum Dechen Dolma. Rinpoche had one older brother, H. H. Jigdal Dagchen Sakya, and five sisters: Thubten Wangmo and Kalzang Wangmo, who have passed away; Tsegen Wangmo and Chime Wangmo, both Seattle residents; and Konchog Yangki, who lives in Indiana. In Rinpoche’s previous birth he was the monk Jamyang Thubten Zangpo, the younger brother of Sakya Trichen Dragshul Trinley Rinchen, who was the grandfather of the present Sakya Trizen. His residence was the mansion Nagtse Labrang, a branch of the Dolma Podrang. In that life Trinley Rinpoche took both novice and full monk’s vows from the 13th Dalai Lama, Thubten Gyatso, and because of his monastic commitment he brought into this life a propensity for becoming a monk once again. Trinley Rinpoche’s education was the traditional one for members of the Khon lineage – it began with the transmission of a Manjushri empowerment from his father, underscoring the close connection between Manjushri and the Sakya hierarchs. 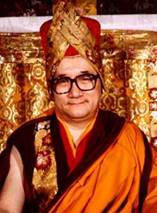 Then, after being taught to read and write, Trinley Rinpoche memorized the Hevajra Tantra. When he had recited it to the satisfaction of his father and the officials of the North Monastery in Sakya, he was presented the written text and other gifts by his father. Like Manjushri, Hevajra has an especially important connection with the Sakya lineage. As his root lama, Trinley Rinpoche’s father gave him the scriptural reading, the explanation, and the empowerment for all the tantras which Trinley Rinpoche learned in Sakya. After receiving each of these, he performed the requisite meditational retreats. In addition, he received from his father the Lamdre Tsogshe, the main teaching of the Sakya Tradition. During his youth Trinley Rinpoche accompanied his father on journeys to religious sites in Western and Central Tibet, India, and Nepal. Guiding Trinley Rinpoche’s education was Ponlob Shedrup, who belonged to the Pentsangpa, a group of the 16 foremost Buddhist practitioners from Sakya’s North Monastery. Ponlob Shedrup directed Trinley Rinpoche’s memorization of tantras and his study of religious dance, music, philosophy, and kingkor (mandala) drafting – the laying out of the yidam’s palace. Trinley Rinpoche received instructions from the former Abbot of the South Monastery of Sakya, Champa Jampal Zangpo, in such texts as the Bodhicaryavatara and the Madhyamikavatara, and commentaries on these two treatises. His Eminence Khöndung Avikrita Vajra Sakya, the Head Lama of Sakya Phuntsok Phodrang, was born in Seattle on May 26, 1993, the elder son of H.E. Khöndung Zaya Vajra Rinpoche and Dagmo Lhanze Youden. At the age of six, he began his training in India to follow in the footsteps of his noble Khön forebears. He has received an uninterrupted stream of transmissions and teachings from his late grandfather, H.H. Jigdal Dagchen Sakya Dorje Chang (1929-2016), including the Lamdre Tsogshay; from H.H. 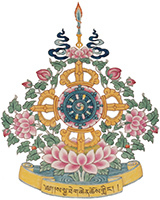 Sakya Trizin, including the Lamdre Lobshe; and from many high Lamas of the Sakya tradition. Having mastered the intricate rituals of the Sakya lineage, completed meditation retreats, and presided as Vajra Master of the annual Vajrakilaya ceremony in Ghoom, Darjeeling, H.E. Avikrita Sakya enrolled in 2010 at Dzongsar Institute of Higher Buddhist Philosophy and Research. There he is successfully building on his extensive learning in the Buddha Dharma with a program of study and dialectics to gain proficiency in the classic treatises of the Sakya philosophical tradition. As well, since 2016, he has assumed the role of revision teacher (teaching assistant) at Dzongsar Institute. For more than eight years, H.E. Avikrita Sakya has been sharing his rich Dharma teachings with warmth, clarity, and wisdom around the world. His Eminence Khondung Asanga Vajra Sakya is the son of H.E. Dhungsey Ani Vajra Rinpoche and Dagmo Chimey Drolkar. He is also the grandson of H.H. Dagchen Rinpoche and therefore a direct descendent of the unbroken Khön lineage which dates back to 1073. Asanga Rinpoche was born on May 1st, 1999 in Seattle, Washington. In April of 2005, at the age of five, Asanga Vajra Rinpoche left Seattle to begin his new life to live, study and train as a future Tibetan master who will further the Sakya Khön lineage. While at Tharlam Monastery in Nepal, Asanga Rinpoche has been receiving religious training from selected Tibetan monk scholars. In 2007, he received the Lamdre Tsogshay teaching from his paternal grandfather, H.H. Dagchen Rinpoche. 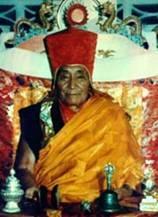 The following year, Asanga Rinpoche received the Lamdre Lobshe teachings from his paternal grand-uncle H.H. Sakya Trizin. He has also received many other very important empowerments, teachings and religious instructions from other great masters such as H.H. the Dalai Lama, H.E. Chogye Trichen, H.E. Appey Rinpoche, H.E. Luding Khenchen as well as his maternal grandfather, H.E. 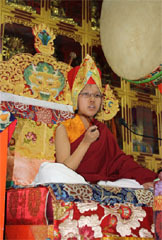 Garje Khamtul Rinpoche, who is a Nyingmapa master. His Eminence Khöndung Abhaya Vajra Sakya, the younger son of H.E. Zaya Vajra Sakya and Dagmo Lhanze Youden, was born in Seattle in 1997. At the age of 11, he joined his brother H.E. Avikrita Vajra Rinpoche in India to pursue his education in the Sakya tradition. At the age of 12, he expressed his strong wish to receive monastic ordination. He received his monastic vows from H.E. Luding Khenchen Rinpoche in an ordination ceremony witnessed by H.E. Luding Khenshon Rinpoche, H.E. Khangsar Shabdrung Rinpoche, Ven. Antro Tulku and the Abbot of the Sakya Vajrayana College, Khenpo Konchog Gyaltsen, at the Ngor Luding Ladrang in Manduwala, India. He has devotedly studied the Tibetan Buddhist rituals, literature and grammar, and has received teachings from his late grandfather H.H. Jigdal Dagchen Sakya Dorje Chang, H. H. Sakya Trizin, H. E. Luding Kenchen, and other high Lamas of the Sakya tradition. He now studies at Dzongsar Institute of Higher Buddhist Philosophy and Research. In 1906, the Fire Horse Year, H. E. Dezhung Rinpoche was born in the mountainous Ga region of East Tibet into a family famous for its skilled physicians. When he was only five years old, Rinpoche appealed to his parents to be sent to a monastery so that he could devote his life to the Buddhist path. Impressed by his request, Dezhung Rinpoche’s parents realized that this was no ordinary person, but one destined to a very special religious role. He then went to study and live with his uncle, Ngawang Nyima, a monk who spent most of his life in retreat at the Thaglung Monastery in Ga. Dezhung Rinpoche began to learn letters and memorization and did chores for his uncle. As a boy Dezhung Rinpoche read the biography of Milarepa in whom his uncle had strong faith, and he was so inspired by the life of this great saint, Dezhung Rinpoche himself wished to become a yogi. Instead, his future responsibilities bounded him to a more traditional approach to the Dharma. Much later in life, Dezhung Rinpoche expressed his continued devotion to Milarepa with a pilgrimage to all places of importance in that saint’s life. The lama from whom Dezhung Rinpoche took the vows of Refuge was Kunga Nyima, who along with Ngawang Nyima, practiced the meditation on Vajrayogini. He therefore instructed Dezhung Rinpoche in the practice of the Black Demchog, a preliminary to Vajrayogini meditation. At age ten Dezhung Rinpoche finally met the great Sakya lama Ngawang Legpa Rinpoche, who had just emerged from a fifteen year retreat. This master was to become Dezhung Rinpoche’s root lama, of whom he spoke with the greatest devotion and gratitude. When Dezhung Rinpoche was fifteen years old, Legpa Rinpoche gave him his novice monk’s vows, and Dezhung Rinpoche subsequently became Lama Legpa’s main disciple. Dezhung Rinpoche’s early education included instructions in spelling, etymology, versification, and rhetoric, Mahayana and Vajrayana treatises, and in particular on the Madhyamika or Middle Way. Among his lamas at this time were the Gelugpa lama, Lozang Chokyi Gawa, and a Nyimgmapa lama, Shenga Chokyi Nangwa. When Dezhung Rinpoche was eighteen, he was recognized by the officials of the Dezhung Monastery to be the third rebirth of Dezhung Lungrig Nyima, and was accorded the appropriate wealth, position, and quarters in the monastery. He remained in residence at the Thaglung Monastery, however, rather than interrupt the precious teachings he was receiving from Legpa Rinpoche. Lama Legpa grounded Dezhung Rinpoche in the traditional method of listening to the Dharma, contemplating the teachings, and then practicing them, and he directed Dezhung Rinpoche to meet as many great lamas as possible. Dezhung Rinpoche describes Legpa Rinpoche as a very kind lama who kept the strict vows of a Bhikshu monk. 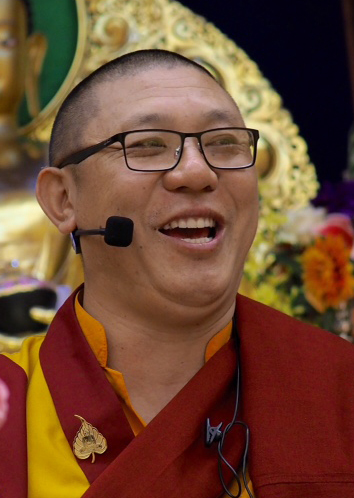 Because of his great faith in Legpa Rinpoche, Dezhung Rinpoche chose for his personal practice the development of compassion through meditating on Chenrezi, Legpa Rinpoche’s primary practice. Lama Legpa’s daily recitation of mantras of Chenrezi greatly inspired Dezhung Rinpoche, who seemed always to have this mantra on his lips. Following the guidance of his lama, Dezhung Rinpoche received extensive teachings and empowerments from over forty additional lamas, including the renowned Rime master, Jamyang Chokyi Lodro. These teachings included the major texts of Tibetan Buddhism. For example, Dezhung Rinpoche received the Sakya Lamdre Tsogshe and Lamdre Lobshey four times and became a recognized master of these teachings. He was given the transmissions contained in the Druptap Kundu, a fourteen volume collection of meditational texts on a thousand deities, and as a part of his devotional tantric practices, Dezhung Rinpoche completed over ten years of retreats. Dezhung Rinpoche’s journeys took him to monasteries throughout Tibet, and his reputation as a scholar and skilled practitioner led to numerous appeals for teachings and empowerments. In Sakya, Dezhung Rinpoche visited more than twenty monasteries where he expounded on a vast range of subjects. He imparted the Chenrezi empowerment to over ten thousand monks. During his late thirties Dezhung Rinpoche lived and traveled among the nomads of East Tibet who constituted the supporting community of his Dezhung Monastery. When lay people expressed the desire for explanations of the Dharma, Dezhung Rinpoche held public meetings in East Tibet at which thousands gathered to hear him teach about Chenrezi. When his niece married Dagchen Rinpoche, a close relationship developed between Dezhung Rinpoche and the Sakya Hierarchy, and Dezhung Rinpoche later served as lama-tutor to Dagchen Rinpoche’s eldest son, Minzu Vajra. At the time of Legpa Rinpoche’s passing, he appointed Dezhung Rinpoche to succeed him as Abbot of Tharlam Monastery. However, soon after, Dezhung Rinpoche and one hundred of his monks were forced to flee the approaching armies of Communist Chinese, and only forty monks survived the lengthy and dangerous escape to India. Dezhung Rinpoche accompanied H.H. Jigdal Dagchen Sakya to the U.S. in 1960 to participate in a University of Washington research project on Tibetan culture and religion. In 1974 Dezhung Rinpoche co-founded in Seattle with H.H. Jigdal Dagchen Sakya Rinpoche the original Dharma Center called Sakya Tegchen Choling–which eventually became Sakya Monastery of Tibetan Buddhism. During his twenty years in this country, he gave countless teachings and empowerments at centers across the U.S. and Canada and founded Sakya centers in New York City, Minneapolis, and Boston. Members of Sakya Monastery in Seattle have been most fortunate to receive extensive teachings from Dezhung Rinpoche and to be inspired by his great compassion. Dezhung Rinpoche spent most of 1981 in Katmandu, Nepal supervising the building of the new Tharlam Monastery and teaching the numerous Tibetan and Western students. In the ensuing years between the founding of Tharlam Monastery and his passing in 1987, Dezhung Rinpoche traveled between the US and Nepal giving teachings and raising funds for the new monastery. All who were fortunate enough to be able to see him were affected by his great knowledge and compassion. Dezhung Rinpoche’s reincarnation, Sonam Wangdu, was born in Seattle, Washington on November 12, 1991. He was formally enthroned at Tharlam Monastery on March 8, 1994. His tonsure ceremony was performed by H. H. Sakya Trizin on April 6th of that year. At the same time he was given his formal name, Ngawang Kunga Tegchen Chokyi Nyima, by H. H. Jigdal Dagchen Sakya. He now resides and studies at Tharlam Monastery. H. E. Dagyum Chenmo Kusho, known by her friends as Dagmola, was born in eastern Tibet. Raised in a loving family of moderate affluence, her way of life and education were pervaded by the spirit of Buddhism. In a society in which most education was of a religious nature, available chiefly to monks, she had the unusual good fortune to receive a fine education from an early age. Dagmola’s childhood came to a swift end. As a very young woman she went on pilgrimage from Kham, her homeland, to Sakya, the headquarters of one of the four major orders of Tibetan Buddhism. She was introduced to the politics of the Sakya ecclesiastical hierarchy, and she was eagerly courted by a young religious nobleman of the Phuntsok Palace who was being prepared to become the Head Lama of the Sakya Order, H. H. Jigdal Dagchen Sakya. As a result of her marriage she accepted the heavy burden of entering the ranks of Tibetan nobility and of representing the ancient tradition of this spiritual lineage. While the young Dagmola accustomed herself to her new way of life, the freedom of the Tibetan people began to be eroded by the infiltration of Chinese Communists into eastern Tibet. Before long, open hostilities between the communists and the Tibetans became more prevalent, and the Chinese responded with increased oppression and flagrant disrespect for the native culture. The carefree days of Dagmola’s youth had now vanished. Upon returning to Central Tibet, Dagmola witnessed the severe oppression, deceit, and manipulation the communists perpetrated upon her people. As violence erupted in Lhasa, where she and her family were visiting, they were forced to flee for their lives. Optimistic like many other Tibetans that they would return home once hostilities had subsided, they fled south, but as they received reports of the growing violence in the Tibetan capital, these hopes vanished. Enduring extreme hardship and fear in their flight from Tibet, her family frequently relied on prayer for their safety and looked to divinations and omens to guide them to freedom. Even in such dire circumstances her family displayed a resilience and courage common among the Tibetan refugees. With an abiding faith in the Buddha, they opened themselves in trust to an unknown future which presented itself in an offer to H.H. Jigdal Dagchen Sakya to come to the United States to collaborate in research at the University of Washington. During the years since their arrival in the United States, Dagmola selflessly devoted herself to bringing up her five sons and assisting her husband in his many religious activities, in particular, the establishment of Sakya Monastery. She also quietly devoted herself inwardly to spiritual practice under the guidance of her revered uncle, H.E. Dezhung Rinpoche. H.E. Dezhung Rinpoche encouraged her to begin teaching Buddhism and granting empowerments. Thus, Dagmola is authorized to accept the role of Lama by one of the foremost Tibetan Buddhist masters of the Sakya Order and by other esteemed Tibetan Lamas. 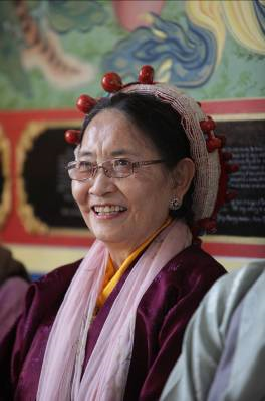 Dagmola regularly bestows empowerments and teaches at Sakya Monastery. She has founded the Mother Tara Center/Tara Ling in San Gabriel, California and established centers in Kona, Hawaii; Flagstaff, Arizona; and Mexico City. Khenpo Jampa Tenphel Rinpoche comes to us from the Dzongsar Insitute in North India, where he taught and served as library director for many years. He received his Degree of Acharya after nine years of study and was graduated as Khenpo in 2004 after thirteen years of study. He spent seventeen years studying with his main teacher, H.E. Khenchen Kunga Wangchuk. He has received empowerments from all four schools of Tibetan Buddhism and from many great masters including H.H. the Dalai Lama, H.H. Sakya Trizin, H.H. Dagchen Rinpoche, H.H. Karmapa, and H.E. Dzongsar Khyentse. He now teaches intermediate and advanced level classes on Buddhist philosophy, sutra and highest yoga tantra all over the world.